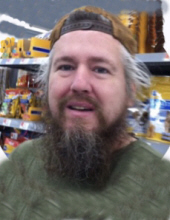 Craig Murray Trauner, 49, of Branford, passed away on March 18, 2019. Born in New Haven on October 12, 1969 to the late Elizabeth-Ann Murray Trauner. Craig had a creative spirit and enjoyed writing music and poetry. For many years he had been a member of the International Society of Poets. One of his many accomplishments was having his poetry published. Craig will be remembered for his sensitivity and kind heart. He leaves his uncle, William (Sharon) Murray of Danbury; his aunt, Jane (Curtis) Andrews of North Haven; his brother, Scott (Kate) Trauner of Wallingford. He was predeceased by his maternal grandparents, William and Elizabeth Murray, Sr.
To send flowers or a remembrance gift to the family of Craig Murray Trauner, please visit our Tribute Store. "Email Address" would like to share the life celebration of Craig Murray Trauner. Click on the "link" to go to share a favorite memory or leave a condolence message for the family.